Cables, like unruly office workers, often need to be managed. Left to their own devices, cables easily become ugly, tangled messes and can make an otherwise neat room seem untidy. Fortunately, with some creativity and a little work, you can turn that pile of twisted cables under your desk into an organizational dream. Besides, it’s been proven that working in an orderly environment helps you to better focus your thoughts, boosting productivity. And did you know clutter can actually cause stress? Luckily, with a few, innovative solutions, decluttering your home office with the help of a cable management system is easier than ever before. Today, there is a huge variety of cable management systems available on the market. In this short guide, we will go over the best options so that you can make an informed decision about which cord control system is best for your home office. Let’s take care of the nitty gritty first. If you’ve got lot of cables lying around, chances are you can put some of them away—at least temporarily. In addition to the cables you have currently in use, do you also need some cables only on an intermittent basis? If, like most of us with home offices, the answer to this question is yes. Consider acquiring some cable storage products. These range from foldaway organizers with rubberized elastic straps to hold in all of your not-so-frequently used cables and accessories to simple spools for bundling and organizing cables. Organizing expert tip: label your cables using a label maker, adhesive labels ,or even colored duct tape. 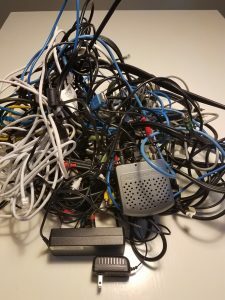 Even if you think you know all your cords by heart, it’s best to be able to tell which is which at a glance, instead of having to rummage through the organizer. Best of all, most of these cable storage solutions are very inexpensive (under $20). Because of their low cost they’re a great way to start organizing that drawer or bin full of rarely used cables. Once you’ve cleared your workspace of excess cords, it’s time to figure out how to organize those cables you do actually use on a regular basis. You may not think of cable management as an exciting topic, but really, what’s more exciting for those of us with home offices than a stylish, organized workspace? Organizing your cables shouldn’t take an enormous amount of time. That makes reigning in your cables a great weekend project. If you’re serious about tidying up your office once and for all, read on. You’ll learn about the many different types of cable management products available on the market and have your office in ship shape by Monday! If you’re not into spending a lot of money on higher end cable management solutions, there are a lot of products that can double as organizational tools. Enter the zip-tie. Use the zip-tie as it is intended to permanently cinch your cables together. Or, if you don’t want to have to cut through each tie when it’s time to remove them from the cables, just create a loop around the cables and slide a small piece of vinyl tubing to hold the cords in place. If you have longer cables that pile underneath your desk and the zip-tie is just too unsightly for you, there are also ultra cheap cable shorteners. These are sometimes referred to as cord wraps. Cord wraps are tiny, bone shaped products. This allows you to wrap the stray cables around them, shortening their length. No more tripping over loose wires. There are also small cable winding boxes which can help to hide smaller cables like USB charging cords and headphones. If your setup includes lots of large, thick cables, though, these products might not offer the most bang for your buck. Another bare bones option for no frills cable management: zip-up cable sleeves. These are thin, fabric cord covers that zip your cords into place. Zip-up sleeves are available in a variety of lengths and generally make your workspace more orderly and attractive. Many zip up options include exit holes. This allows you to run them horizontally against the floor and have your cables neatly rise up to the device they are powering. Zip up covers typically come in white, black, or beige, making it easy to run the across your baseboard or match them to your desk. Flexible cord management covers are a super easy and very inexpensive way to wrangle your stray cords. The most common form of these covers is the three-channel variety. If you’ve ever worked in the events industry, you may be familiar with these cable covers which are commonly used to keep gatherings running safely by holding down errant cords so that no one trips over them. You simply run the cords through the covers and place them in your desired location. Because of their weight and shape, they stay flat to the ground. The only downside is the aesthetics. While these types of cord covers are functional and cheap, they might not fit in with your workspace’s unique décor. If you want your cable management system to match your home office’s sleek style, this might not be the best solution for you. There are other types of cord covers which might blend in better with your workspace’s interior design. A cotton “chandelier” cord cover can soften the look of your office instantly with its ruffled look. Chandelier cord covers come in a huge range of fabrics like linen, cotton, and faux-satin, to add funky flair to your room. For running longer cords across carpeted rooms, you can also use a flat fabric carpet cord cover in a color similar to your flooring. These cord covers are specifically designed to stick to most standard carpeting and can be cut to fit any room shape. If you have wood or laminate flooring in your workspace instead of carpet, there are cord covers with wood-like finishes. These are available in a variety of stains to match your flooring from dark oak to a raw wood version you can stain yourself for a highly customized look. The drawback: cord covers of these types usually run for quite a bit more money than the standard three-channel variety. For home offices with lots of high tech gadgetry—and as many cables—a wall mounted cable management system might be ideal. The In-wall systems are pretty self-explanatory—they are recessed boxes that keep your cables within the wall and out of sight. The In-wall cable management systems are a bit costlier and are more labor-intensive to install than other systems you can use straight out of the box. But ultimately, they present the most professional management option. If you are adamant about never seeing a stray cord again, the in-wall system is for you. Raceway cable managers run atop your wall’s surface to keep cables together and hidden. Many use raceway management systems as an effective way to hide unsightly television and home theater cables, but they can easily be used in a home office setting. Use a raceway kit if your outlet is far from your desk and your cords are strewn along the wall on the ground. They conveniently come in a variety of sizes and finishes. Raceway kits often come with a variety of corner attachments. This allows you to create any configuration you need to effectively run your cables. If you have lots of cables that need to be connected to a power strip, you can count on a box cord organizer. These are very simple, but effective devices—a plastic or neoprene box with a well-sized slit on either side to allow for the cables passage. To use it, just wind up your cables and drop into the box. Voilà! No more rat’s nest of cables behind your desk. Box cord organizers are available in a variety of colors and finishes, from your basic solid-colored plastic boxes to retro-styled wood grain containers. But, even though they are the most basic solution to the mess of cords problem, most box organizers will set you back upwards of $20. Cable trays can be a fantastic option if your home office set up doesn’t include a whole lot of high tech equipment with tons of cords. They consist of a simple wire basket that attaches to the back of your desk or hangs underneath it. You can simply install the tray, drop your wires into it and be done! Many cable trays are designed to be wide enough to fit a who surge protector or power strip in addition to other cables and plugs. This is great because it gives you the opportunity to completely clear the floor space under your desk. Just make sure you set a liner in your tray if you plan on using it to store smaller items, since these could fall through most trays’ wide grids. There are lots of quirky products out there to suit your office setup regardless of your style. For example, are you more IKEA than Pottery Barn? Cable management go Ikea (price) every time! There are small combination cord routers and winders that come in a variety of shapes, sizes, and colors. To use these, simply stick them onto the desired surface and wind your cord around the base, then loop through the gadget. Place a few in a row to create a pathway from the outlet to your device. Also available are flexible, adhesive cable clips which you can stick to almost any surface for a custom look. Others opt for the DIY route when getting their cables under control, which sometimes results in silly solutions like cutting pool noodles in half and stuffing cables inside, or “upcycling” old telephone cords to use as cable wrappers. Ok Ok there are legitimately useful DIY projects on the web that can help you make your home office sleek while saving you a considerable amount of cash. One of the most useful DIY ideas—purchasing cheap plastic cord covers and covering them in a contact paper to match your hardwood flooring. Another great project: creating a charging station for all your devices by cutting holes out of a decorative document box. Take it a step further and drill holes into the back of a dresser and make the top drawer a charging station. While working from home means you might never take off your pajamas again, don’t let it be an excuse for leaving your office in disarray. Giving your workspace a neatness makeover can be as simple as sorting and organizing your stray cords. With the wealth of products made specifically for this purpose, there’s no doubt you can find the right organizational solution for you. So, what are you waiting for? Get to work making your office the perfect productivity oasis.